The leader of the UK Independence Party (UKIP) has called for the Electoral Commission to be dissolved, after it emerged the regulator had approved a joke party planning to run against him in the general election. Upon hearing the Commission had given comedian Al Murray’s spoof ‘Freedom United Kingdom Party’ (FUKP) permission to stand, Nigel Farage said all the regulator’s employees should lose their jobs. FUKP describe themselves as the “common sense” party, playing on UKIP and Nigel Farage’s ‘everyman’ persona, and advocates humorous policies, such as bricking up the channel tunnel to stop an influx of immigrants. 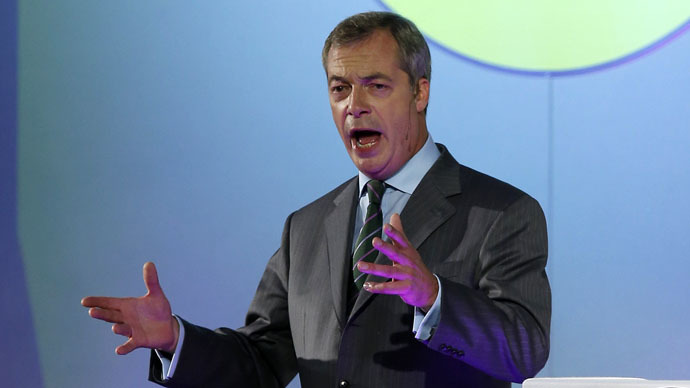 The decision means Farage will have to compete against the comedian for the South Thanet seat. Local supporters of UKIP have reportedly protested against the joke party, saying that voters may muddle up the two similar acronyms at polling stations. The decision may help silence Murray’s critics, who say his sudden political interest is merely a publicity stunt. It was recently revealed Murray has booked a comedy gig in Dartford on the night of the election. Murray will run against the UKIP leader in the guise of his satirical alias, ‘the Pub Landlord,’ who is known for his right-wing patriotic views, often pictured pint in hand, not unlike Farage himself.